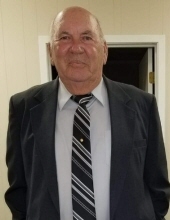 Billy Dean Cooper, 85, of Wiggins, MS passed away at his residence on November 15, 2018. He was preceded in death by his first wife; Jean Cooper, parents; Chevis and Dorothy Cooper, siblings; C.L. Jr., Bobbie Jean Williamson and O’Marie King and one son, Steven Middleton. He is survived by his wife, Jurlean Cooper of Wiggins; children, Karen Reeves (Ronnie) of Wiggins, Austin Cooper (Linda) of Wiggins, David Cooper (Shannon) of Wiggins, Michelle Littlefield (Nevalin) of Wiggins, Mickey Middleton (Teresa) of Lucedale, Deborah Thompson of Wiggins and Pamela Kelley (Quinon) of Lucedale; one daughter in law Weaton Middleton of Chattanooga; one sister, Christine Berry of Wiggins; numerous grand and great-grandchildren and a numerous nieces and nephews. Visitation will be Saturday, November 17, 2018 from 6:00p.m. Until 9:00p.m. At Moore Funeral Home in Wiggins, MS.
Service will be Sunday November 18, 2018 at 2:00p.m. Interment will follow at Cooper Cemetery. Moore Funeral Home in Wiggins is in charge of the arrangements. To send flowers or a remembrance gift to the family of Billy Dean Cooper, please visit our Tribute Store. "Email Address" would like to share the life celebration of Billy Dean Cooper. Click on the "link" to go to share a favorite memory or leave a condolence message for the family.